abstract The Sahi Controller allows you to interact with Sahi and easily experiment and debug on the browser. Record tab for Sahi Pro. Browser: This mode is always enabled in Sahi Pro. Uncheck the checkbox for recording or identification in Browser mode only. Windows: Check the checkbox to enable recording or identification for Windows. Sahi Pro Desktop Add-on should be installed for this. Java Applet: For recording or identification in Java Applet mode Sahi Pro Desktop Add-on should be installed. Java Web Start: For recording or identification in Java Web Start mode Sahi Pro Desktop Add-on should be installed. Value: shows the value of the current element. Mostly this is the input text or the visible text. Mode: shows mode of application for which element is recording or identifying (not present in Sahi Pro). These buttons perform various actions on the element and also show the generated script in the "Evaluate Expression" box. These are used to quickly work with elements during debugging/script generation. Click clicks on the identified element. Invokes the _click API. Hilight highlights the identified element (shows a red 1 pixel border briefly). Invokes the _highlight API. Set sets the value in "Value:" field on the identified element. Invokes the _setValue API. Hover does a mouse over on the element. Invokes the _mouseOver API. List Properties lists all the properties of the element (name value pairs) in the Evaluate Expression results box. Other Actions lists actions like Double Click, Right Click etc. Click on "→" to test the assertions. 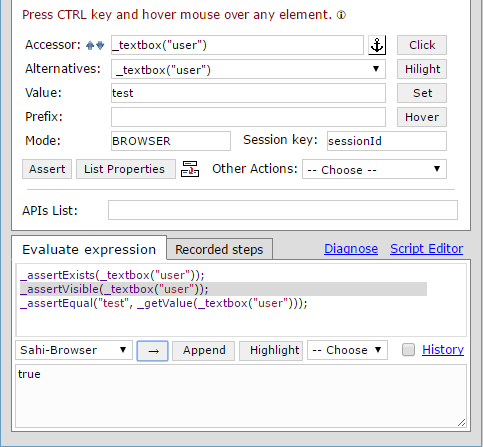 Evaluate Expression box is used to evaluate snippets of Sahi code. It helps while identifying elements or while debugging. Set mode for evaluate Select appropriate application mode before evaluate the expression. JS is used to evaluate java script expretion. 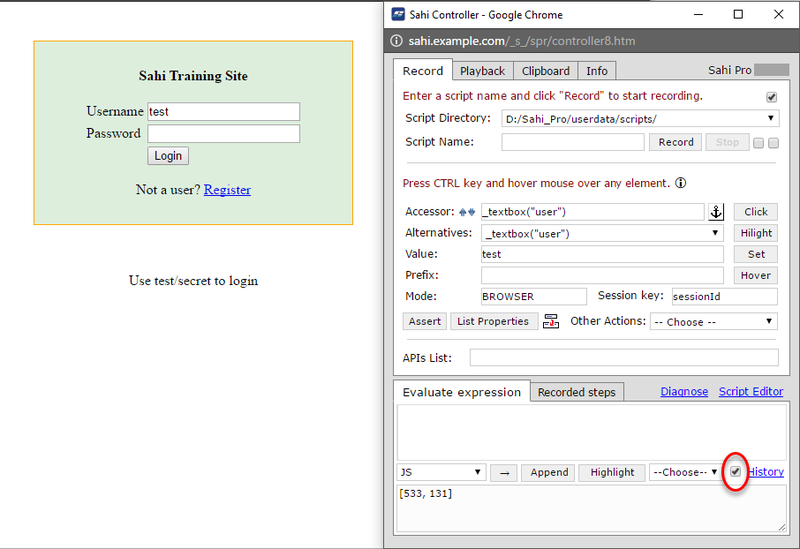 → Put a valid Sahi expression in the Evaluate Expression box and click on "→". The result will be seen in the bottom box. 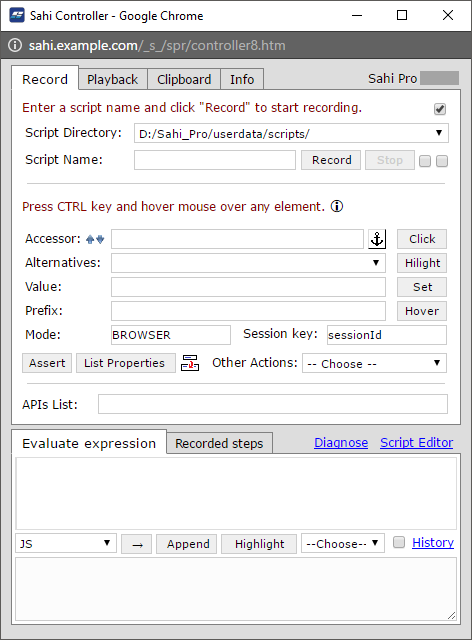 Append to Script While recording, selecting and clicking on Append to Script will append the steps to the currently recording script. This is mainly used for manually append any step from Evaluate Expression to the currently recording script. Highlight Can be used on selected text to highlights the element (shows a red 1 pixel border briefly). Invokes the _highlight API. Drop down Lists some actions like Click, Get Value etc. info Note: Selecting some text and pressing "→" will only evaluate the selected text. User may evaluate more than one statement at a time. Adding a dot (.) after the accessor in the accessor field, shows all the properties of the accessor. Further typing narrows down the list of properties. Clicking on an option (say, disabled) or typing .disabled directly in the accessor field and pressing Enter will populate the value in the "Value:" box. 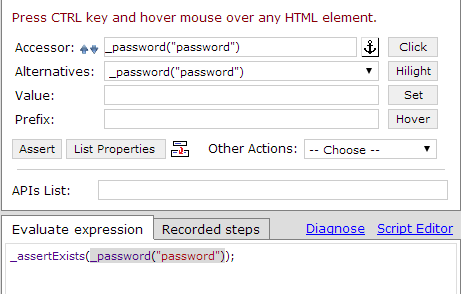 (In this case, .disabled is false) Clicking on Assert will create an assertion for just that property. Up arrow near the Accessor field helps identify the parent element. The Down arrow goes back to the previously identified child element. Suppose we need to identify the third textbox in the UI below. If we hover over the third textbox, it is identified as _textbox("q") Instead, we first CTRL-Hover over Python Cookbook; the accessor field shows: Then we click the Anchor button: Now if we CTRL-Hover the textbox, we see the Accessor now resolves the textbox in relation with Python Cookbook. 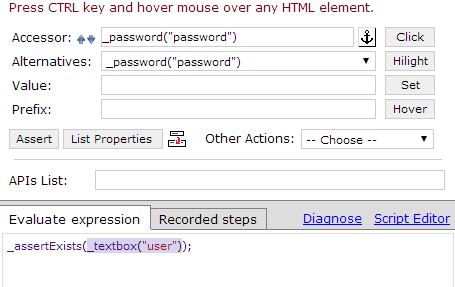 You can directly copy the accessor to the Evaluate Expression box by clicking on this button. Select the text range you want to replace in the Evaluate Expression. Sometimes, you may want to use a Sahi API on only a part of the expression in the Evaluate Expression box. Select the part you want to test. Click on the dropdown, as shown in the figure. Select the API you want to use. 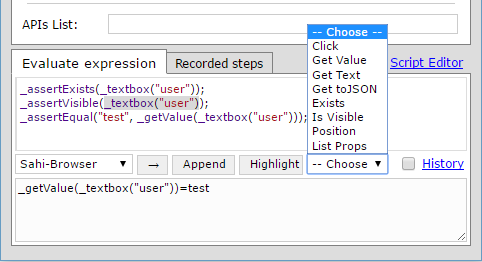 As you can see in the lower box of Evaluate Expression, the API has been used and shown over there. Suppose you want to access an API, but are not sure about the parameters required in it. You can use the APIs List box in such a case. Start typing the API you would like to use. As you start typing the API, a dropdown would appear. Select the API and press the Return Key. To get the coordinates of an element, you can use the checkbox shown in the figure. When checked, it displays the clientX and clientY of the point on screen where CTRL+SHIFT+mouseover event takes place. You can use this option to see recent statements used in the Evaluate Expression box. Select the scripts folder in-use in the 'Script Directory' dropdown as shown in the image below. 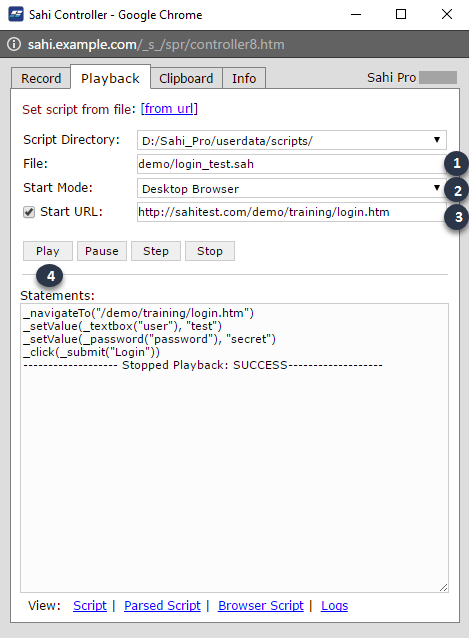 Set the name of the script in the 'Script Name' field. Note: if no extension for the script file is provided, ".sah" is taken as the default extension. Choose the type of application for recording or identification. Check the checkbox to enable recording or identification for Windows. Uncheck the checkbox for recording or identification in Browser mode only. Click on 'Stop' button to stop recording. Accessor Repository (AR) is a central place to keep all Acessors (object identifiers). When an element changes, its identifier can be changed in a single place and it will reflect in all scripts. In Sahi, AR is implemented as a simple Sahi script with a _AR.sah suffix. Accessors are stored in simple variables. If you want to use an Accessor Repository file while recording, you need to check the "Enable Accessor Repository" checkbox. On selecting the checkbox, another text field will appear where you need to specify the relative or absolute path to the Accessor Repository file. 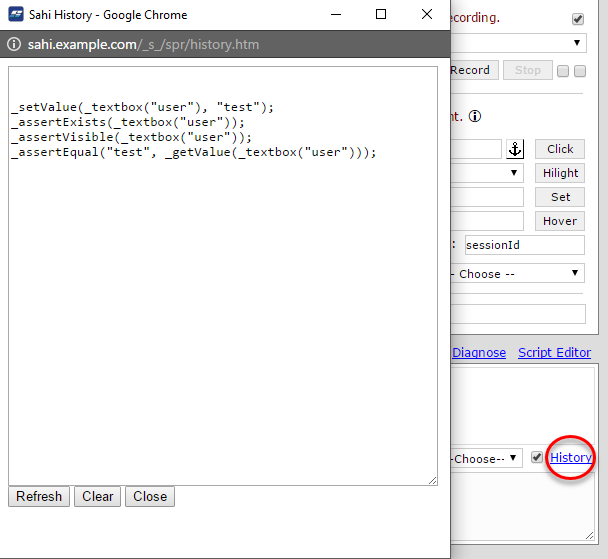 Now if you press the 'Record' button, Sahi will record using Accessor Repository. From 6.0.0 onwards, Accessor Repository is now tightly integrated in Controller itself. 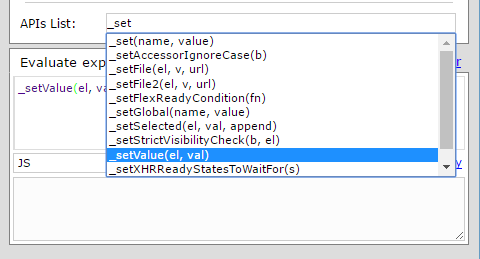 Once a Accessor Repository file is chosen, an element will always be identified first by its AR entry, even when not in recording mode. This prevents the same element from being identified in multiple ways in different scripts. When elements have been smartly identified using Relational APIs like _near or _under once, newer recordings on those pages will simply use the AR entry, so other users do not need to worry about doing it again or wrongfully using a different identification mechanism. There is also provision to modify existing AR entries. 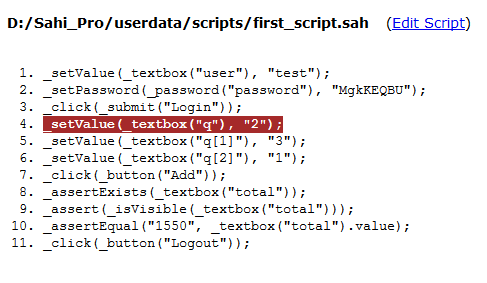 Enter the script name first_script.sah in the 'File:' field (with the help of the autocompletion feature). Enter the Start URL as 'http://sahi.co.in/demo/training/'. For your own scripts, if you had started recording from http://www.google.co.in, use that URL. Click 'Set'. This will navigate the webpage to the URL mentioned in the Start URL textbox. Wait for the page to reload. infoNote: that the Controller can be closed at any time, without disrupting playback. On clicking set(number 3 above), the page refreshes before playing back the script. In order to retain some information on the webpage that you need before playing back the script, you can uncheck the checkbox on the left of the label "Start URL". 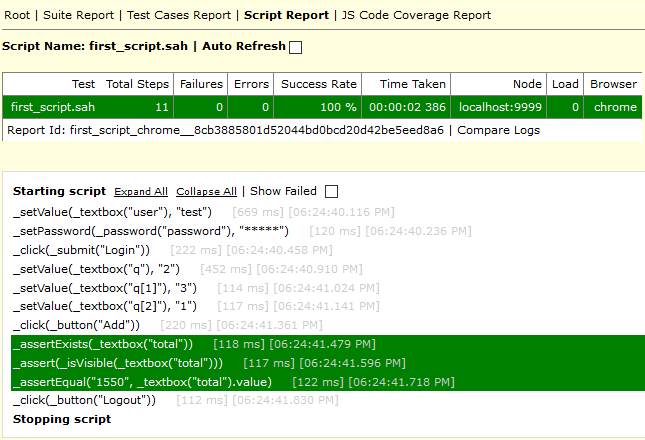 Unchecking the checkbox will run the script on the current page without refreshing it. 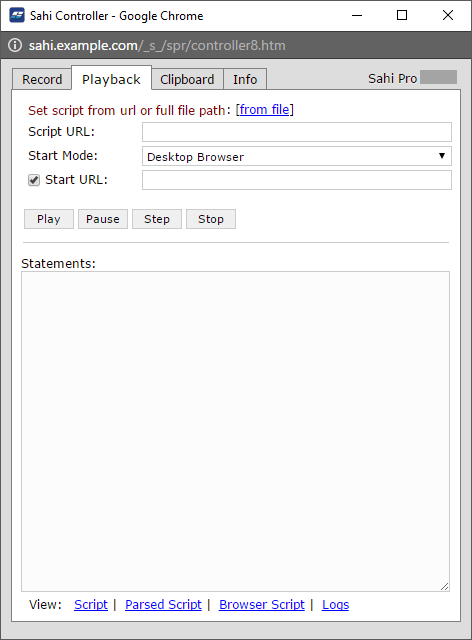 To perform debugging on the script, you can perform various operations like Pause, Play, Stop and Step on the script. 'Pause' enables you to pause the execution of the script. 'Step' allows you to execute the script step by step. Alternatively, you can also playback a script from a URL. Provide the necessary Script URL and Start URL. 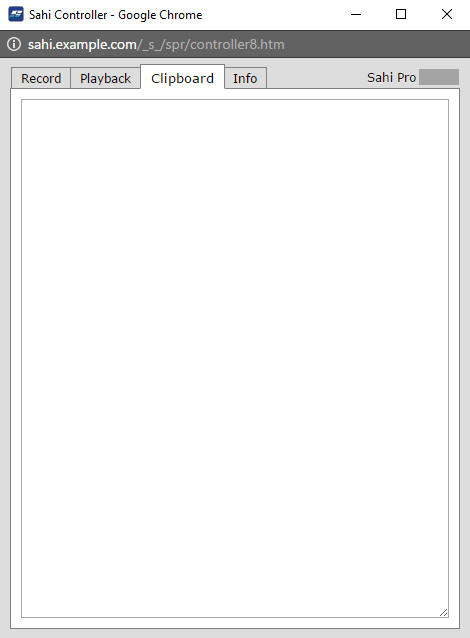 You can use this tab to store small pieces of information. 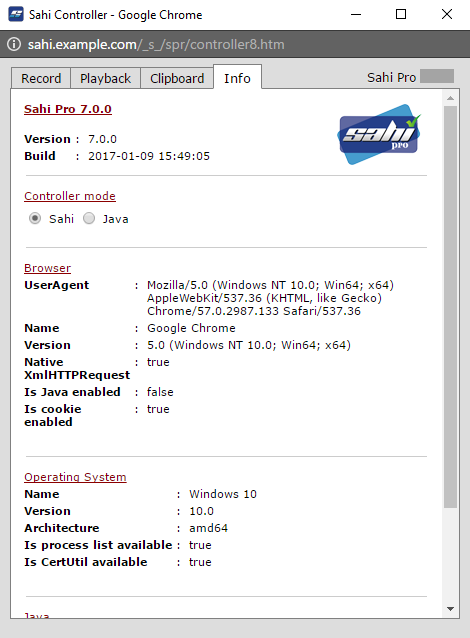 This tab shows the basic information of Sahi Controller, Browser, Operating System and Java.